Other versions of this product are listed below. Fitting hearing aids to meet the hearing needs of an infant or toddler is only the first step. It takes much patience, persistence, love and understanding by the child’s family to reach the goal of full-time hearing aid wear. As the child moves through developmental stages toward becoming an independent person, his or her complacency with hearing aid wear is very likely to change. 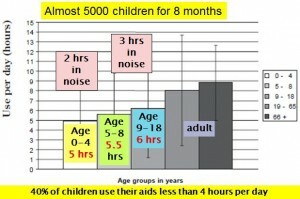 This does not mean that the child is rejecting the hearing aids because he does not like them. It means that he or she is learning new skills towards body control and independence. 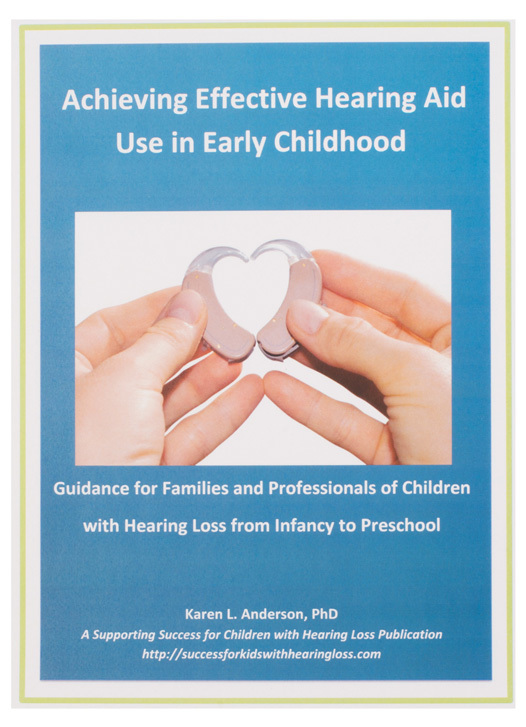 The purpose of this guide is to further understanding of child development, how it will affect hearing aid wear, and what families and early intervention teachers can do to achieve full-time hearing aid wear. 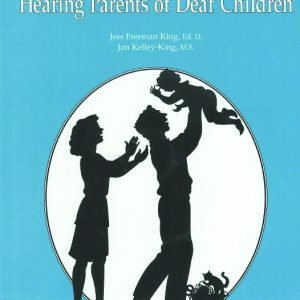 By using the information in this guide, hearing aid retention accessories and specific age-appropriate strategies, it is hoped that families will be better prepared to manage their child’s hearing aid wear. The guide is 88 pages long. The paper version is spiral bound. It is in full color with many engaging photos. 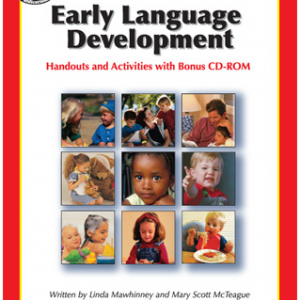 Information written in this guide is directed toward parents, which makes it ideal to use as an intervention guide while providing services to families of infants, toddlers and preschoolers. 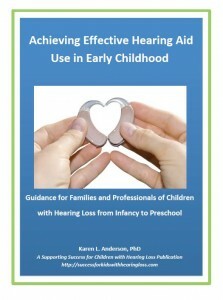 For Families, Early Intervention Providers, Pediatric/Educational Audiologists. 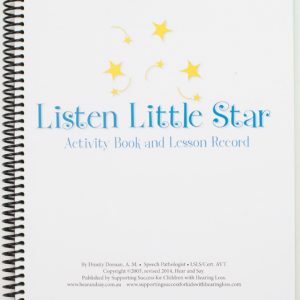 Designed for the school district or local early intervention agency with 4-8 interventionists working with the families of children with hearing loss. If there are more than 8 intervention providers in the district/agency who will use these digital materials then one or more additional restricted use licenses will need to be purchased. Note: In downloading the files that come with this product you are agreeing to abide by the terms of a limited use license, meaning it is only for use by you with your caseload. It is not legal to share downloaded files for others to use . Introduction – Why is this Guide Important? 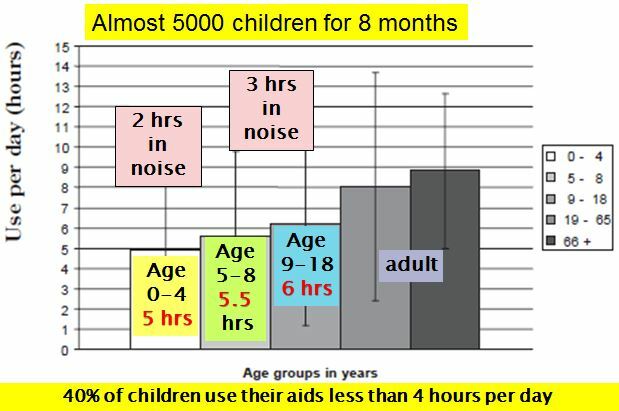 Why should we be concerned about hearing aid wear in young children? With everything else in our lives, how can we deal with this too? He took off his hearing aids again! He isn’t responding to the Ling Sounds – what can it mean? List of Downloadable Files (24 digital files included in purchase price) The following 24 downloadable files are included at no extra cost. They are copyrighted – not “freeware.” The purpose is to enhance the content of this guide or for early intervention teachers to be able to share key information with families and/or school teams. Consent is given for use in supporting individual families. Consent is denied for distribution at conferences or to share with colleagues. Your Child and Hearing Aids: Keeping hearing devices on your child can be hard – but you CAN do it!